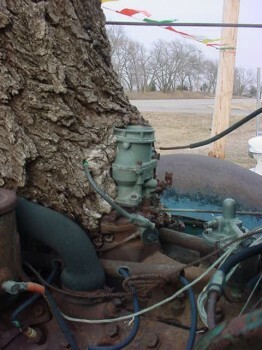 Hoopty Rides: $8,500 Stump! 1936 Ford at No Extra Charge! $8,500 Stump! 1936 Ford at No Extra Charge! This 1936 Ford truck is a little pricey at $8,500 but it sure is cool. 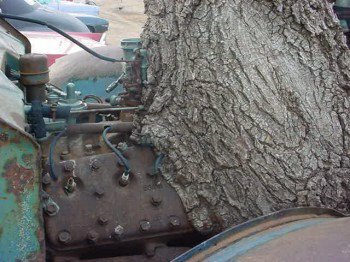 I dream of finding barn cars like this, though in my pea brain I generally don't envision a mature tree stuck to the engine. Now that I have closed that awfully ugly Complete New Yorker chapter (1,2,3,4), I am back to considering bad ideas with full faculties of thought! 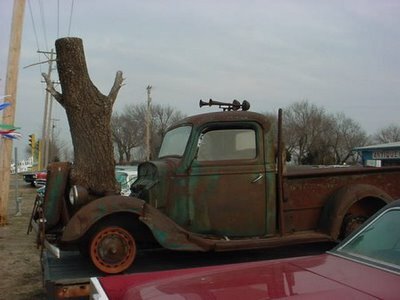 What would it take to drive this truck? Not cross country, but what would it take to drive it to the corner tavern? - Carve a tunnel for the carb and distributor - like peeking inside a sugar easter egg at the bunny inside! - Bore holes for spark plug access - like a Hemi! Ignoring the fact that the engine is probably seized steadfast, think it would run and drive? This is the sort of thing I would buy immediately for $1000.